Basic body massaging procedure where the gentle anointment of warm herbal oil before bath takes place. Along with the rejuvenating and reviving qualities it possess, Abhyanga also prevents ailments. Nourishes body, improves longevity, restores sleep patterns, imparts Dhātus to the body. When used as Moordha Taila, it makes hair grow back thick and glossy, soothes senses and removes wrinkles on the face. 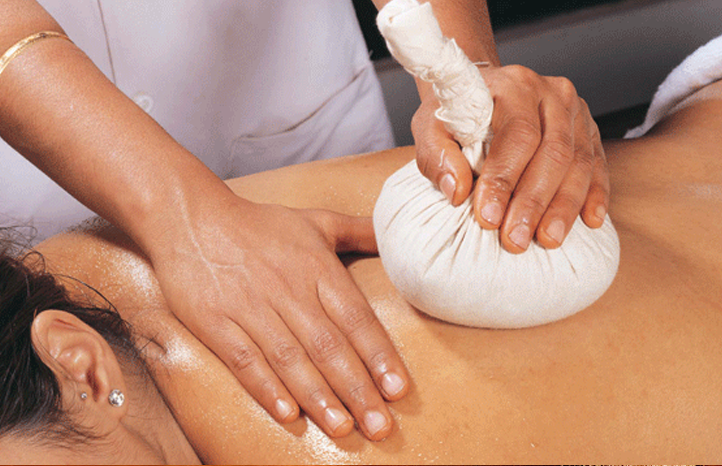 Also known as Shashtikashali Pinda Sweda, this is a unique treatment where perspiration of either the entire body or any specific part of it is allowed to occur by applying muslin bag boluses containing medicinal drugs and njavara rice puddings externally. 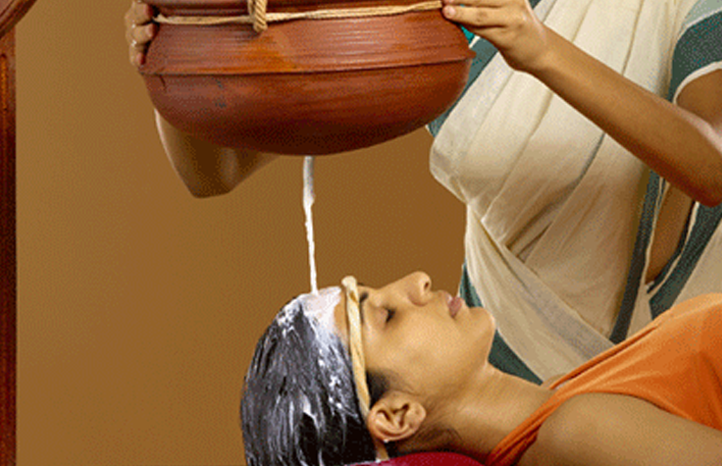 Rejuvenating and strengthening treatment that quells Vata dosha. Also known as Patrapotala Sweda, it is very similar to Njavarakizhi, in a manner such that rice is replaced with fresh leaves or herbs. Heated boluses lead to profuse perspiration resulting in cleansing and rejuvenation of the body and mind. Heated or oil-fried herbal powders (black gram, horse gram, etc.) wrapped in muslin cloth pouches or boluses constitute the Podikizhi. Cures Kapha-Vata predominant arthritis, paralysis, back pain and muscular pains. Useful for increasing blood circulation, alleviating stress and strengthening muscle tissues. 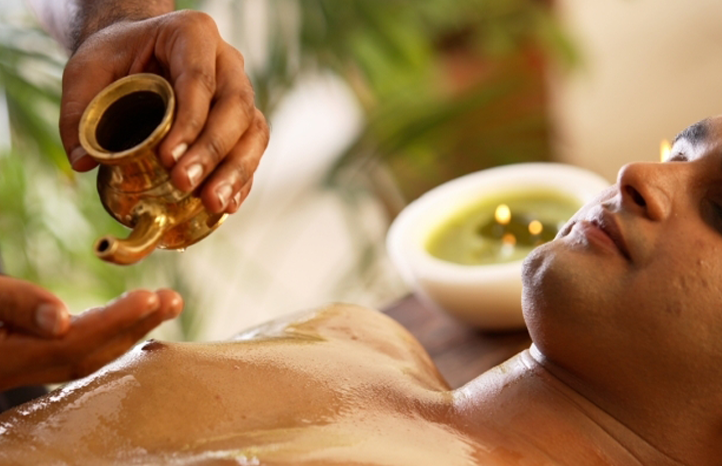 One of the five steps of Panchakarma, Nasyam works by instillation of herbal oils or mixtures through nasal passage. Nasyam is used as a remedy for a wide variety of common ailments such as busting stress, managing pain, detoxification, skin & hair problems, eye care, etc. 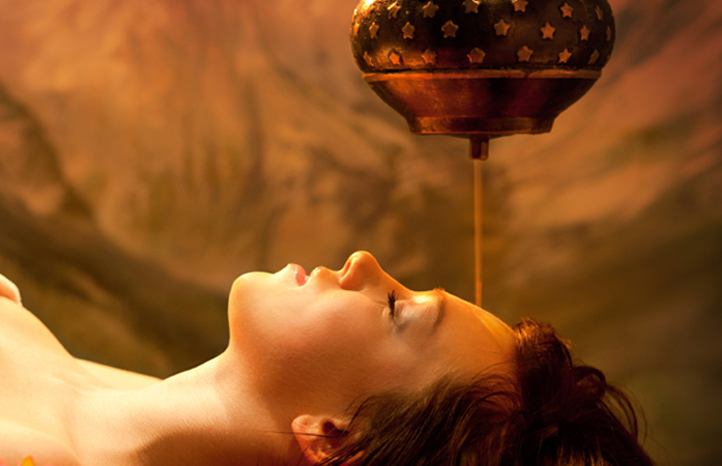 Process of pouring warm herbal oils gently over the forehead in a continuous stream. 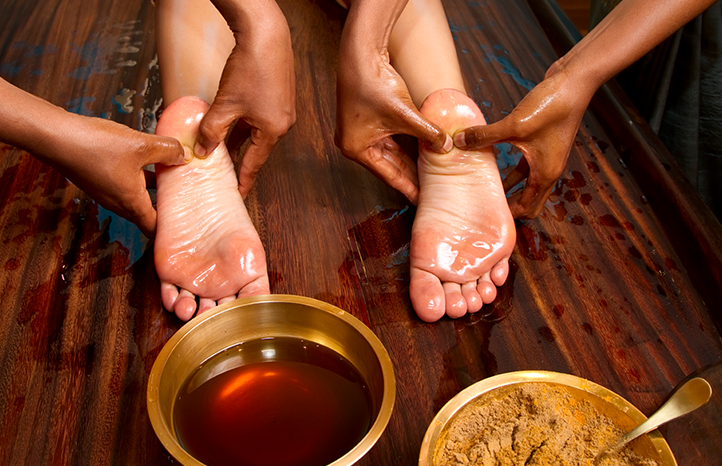 It could be mostly accompanied by Abhyangam (Ayurvedic body massage). Induces sleep, stimulates Marmas or vital points in the head and improves circulation. Helps to treat headaches, depression, stress, hypertension, degenerative conditions of the brain, etc. A long cotton wool soaked in warm medicated oil is applied over the desired area. Effective treatment for spine and cranial disorders. Reduces insomnia, treats hysteria and osteoarthritis, and alleviates back pain. Therapy to treat people suffering from the inflammatory conditions of the skin. Medicines are mixed with some herbal liquids to form a paste (lepam), which is then applied on the whole body or parts of the body that are affected. Rejuvenates blood circulation, relieves aches and cures skin disorders such as eczema, psoriasis, etc. A holistic treatment with the combination of Snehana (oleation) and Swedana (sudation) treatments, or simply the combination of massage and heat treatments. Gentle, synchronized massaging of the whole body is carried out in seven different positions so that the whole body is covered. Takes up to 60 minutes. Relieves anxiety, body pain and regulates blood pressure. Enema with medicated decoction (kashaya). Removes gases inducing pain and toxins, leading to body detoxification. Effective for treating constipation, neurological diseases, paralysis, back pain and gout. Ksheera, especially cow’s milk, is considered the best substance in the nourishment of Asthi Dhatu (bone tissue). Liquid derived from fermented cereals and other medicinal herbs is poured over the body in a supervised stream for a definite amount of time. A type of Parisheka Sweda (process of pouring warm liquids over the body inducing sweat). Tackles inflammatory diseases like rheumatoid arthritis, relieves pain, stiffness and swelling, relaxes the mind, treats neurological and neuro-muscular disorders.